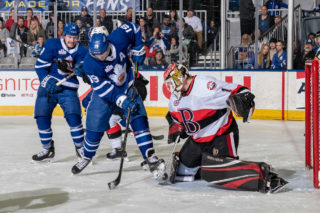 The Toronto Marlies closed out their three in three weekend with a 4-2 win over the Wilkes-Barre/Scranton Penguins on Sunday afternoon. Chris Mueller opened the scoring with a power play goal at 12:59 of the first period, extending his point streak to eight games. Rasmus Sandin recorded the primary assist while Jeremy Bracco registered his 50th assist of the season with the secondary helper. The Marlies held onto their one-goal lead through the remainder of the frame. The Marlies’ power play converted again in the second period as Adam Brooks cleaned up the loose change in front of Tristan Jarry. Bracco and Sandin each assisted on the power play goal, and that assist tied Bracco with Tim Stapleton for the Marlies single season franchise record in power play assists (29). The Penguins solved Michael Hutchinson at 14:59 as Jimmy Hayes got the home team on the board. 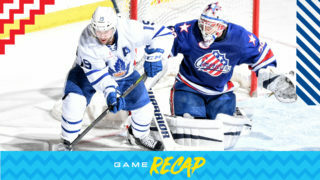 The Marlies added two goals in the final minute of the frame to jump ahead by three heading into the final frame. Michael Carcone restored the Marlies’ two-goal lead at 19:21, firing home a blast from the hash marks. 19 seconds later, Pierre Engvall found snuck one underneath a sprawling Tristan Jarry to make it 4-1 for the Marlies. Jarrett Burton scored at 14:11 of the final frame to bring the Penguins within two, but the Marlies held on for a 4-2 win. 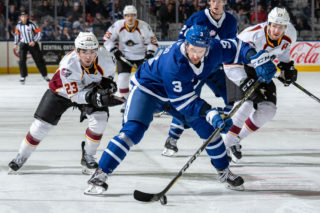 The Marlies will head to Bridgeport on Wednesday for a midweek matchup against the Sound Tigers before returning home to Coca-Cola Coliseum for back-t0-back games Saturday and Sunday. Chris Mueller scored on the power play at 12:31 of the first period and later added the secondary assist on Carcone’s second period goal. Mueller has recorded a goal in his last eight games. Mueller has 57 points (28 goals, 29 assists) in 50 games this season. Adam Brooks scored on the power play at 11:34 of the second period and later added the secondary assist to Engvall’s second period goal. Brooks has five points (3 goals, 2 assists) in his last four games. Michael Carcone scored at 19:21 of the second period. Carcone has recorded 13 points (6 goals, 7 assists) in his last 13 games. Pierre Engvall scored at 19:40 of the second period. Engvall has 28 points (17 goals, 11 assists) through 61 games. Rasmus Sandin recorded the primary assists on Mueller’s first period power play goal and Carcone’s second period goal. He also added the secondary assist on Brooks’ second period power play goal. This is Sandin’s first AHL career three-point game. This is Sandin’s seventh consecutive game recording a point (1-10-11). 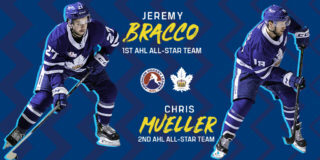 Jeremy Bracco registered the secondary assist on Mueller’s first period power play goal and the primary assist on Brooks’ second period power play goal. With his second power play assist of the game, Bracco has tied the franchise record of 29 for power play assists (Tim Stapleton – 2008-09). This is his fourth consecutive multi-point game (2-7-9). Jordan Subban registered the secondary assist on MacMaster’s first period goal. Subban has 14 points (3 goals, 11 assists) in 40 games this season. Michael Hutchinson stopped 36 of 38 shots he faced. Hutchinson’s recorded with the Marlies is now 12-3-3-0 on the season with a .909 Save Percentage and a 2.83 Goals Against Average. Toronto is 19-8-3-2 since January 4 and have outscored their opponents 105-90, facing 17 different teams. In 24 of 32 games, Toronto has earned a point (43). The Marlies have played three three-in-threes this season and have gone 5-3-1-0. Toronto went 2-for-2 on the penalty kill and 2-for-4 on the power play. Toronto’s power play on the road is first overall (26.5%) in the AHL with the most power play goals-for (41). This is Toronto’s 15th game of the season with two or more power play goals. Toronto had a 38-37 edge in shots in all situations. Pierre Engvall led the Marlies with six shots on goal. The Marlies are 9-6-0-1 against Atlantic Division opponents and are 2-0-0-0 against the Penguins. 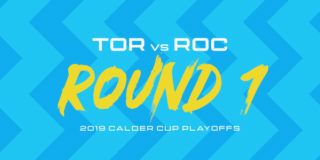 Toronto hosted WB/Scranton on December 1, winning 7-4. Toronto is 28-8-1-2 when recording the first goal of the game. The Marlies are 21-2-1-1 when leading after the first period and 25-1-1-1 when leading after the second period. Toronto is 17-11-4-2 when outshooting their opponent. The Marlies are 4-3-2-1 in Sunday games and are 5-2-0-1 in March. Jeremy Bracco has points (2-6-8) in four consecutive games. Michael Carcone has points (2-1-3) in three consecutive games. Chris Mueller has points (4-2-6) in three consecutive games. Rasmus Sandin has points (1-10-11) in seven consecutive games. Andreas Borgman (concussion) did not dress for tonight’s game. 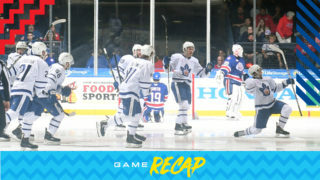 He left Toronto’s game following the first period on February 16 against Springfield. Frank Corrado (knee) did not dress for tonight’s game. He has not appeared for Toronto since February 5 against Belleville. Calle Rosen (foot) did not dress for tonight’s game. He left Toronto’s game in the third period on February 22 against Syracuse. March 14: Signed defenceman Joseph Duszak to PTO. March 14: Returned forward Zach O’Brien on loan to Newfoundland (ECHL). March 14: Signed defenceman Eemeli Rasanen to PTO. March 13: Recalled forward Scott Pooley from loan to Newfoundland (ECHL). It was very important. Clearly, we didn’t like how the game ended yesterday. It leaves a very sour taste in your mouth. You’ve got such a quick turnaround and you’re back at it which is a positive because you get another chance to go out and change it but you have to do that, you’ve got to clear it out of your head and get out and play so that was part of the challenge here today for our guys. It was one of the adversities. The three-in-three and the nature of what it is is another one. I thought our guys met that head on. It was not a perfect game by any means but they’re not going to be perfect at the best of times. I really liked our responses in the game. We made it two-one and then we come back and we control the game and make it 4-1 going into the third. They score again in the third, things could go bad for us especially the way that it’s gone here. I thought we settled in and didn’t give up a whole lot from there and Hutchy was really solid when we needed him to be. I think he’s been really good. He’s taken on a lot of responsibility here and you’re pushing him towards 30 minutes for three games in two-and-a-half days, it takes a toll on any player but as a young guy he’s handled it extremely well. Not just him but all of our defence, with missing so many key people everybody is kind of playing in different situations and we’ve responded well. We haven’t controlled play as much as we’d like to but we didn’t crack defensively a whole lot in terms of giving up real scoring opportunities and that’s a credit to our whole defence but certainly Rasmus is leading the way. The Marlies round out their three in three weekend today, taking on the Wilkes-Barre Scranton Penguins in a Sunday showdown. This is the second and final meeting between these Eastern Conference foes and the Marlies hold a 1-0 lead in the season series after defeating the Penguins 7-4 on home ice back in December. After battling back in the final minutes last night, only to lose in the final seconds to the Lehigh Valley Phantoms, the Marlies will be looking to bounce back and close out the weekend on a high note. Toronto still sits third in the North Division and sixth in the Eastern Conference with 76 points. 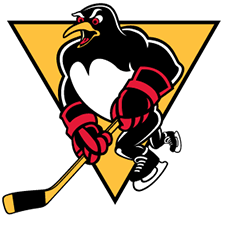 The Penguins are fresh off an overtime win over the Providence Bruins and will be looking to extend their win streak to four straight today. They currently sit fifth in the Atlantic Division and 9thin the Eastern Conference with 69 points. Players to watch: Chris Mueller extended his point streak to seven games last night, registering two goals in Lehigh in his 700thcareer AHL game. He has 13 points (eight goals, five assists) in his past seven contests and continues to lead the Marlies with 27 goals. Jeremy Bracco has points in four consecutive games (two goals, six assists) and has recorded 19 points (four goals, 15 assists) in his last 13 games. He leads the AHL in assists with 49. Rasmus Sandin picked up an assist in Lehigh and now has points in six consecutive games (one goal, seven assists). Ethan Prow has points in four consecutive games and leads the Penguins with 45 points (17 goals, 18 assists). Puck drops at 3:05 PM on AHLTV.